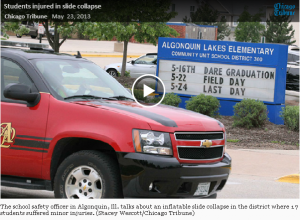 Algonguin-LakeInTheHills Patch reports that, on their final day of school, the accident occurred when several children climbed up the slide at one time, the slide started to sway and then tipped over. In total, 17 children were evaluated for injuries at the school, according to the fire department news release. Of those children, six were taken to hospitals and the rest were picked up by their parents from school. According to the Chicago Tribune report & video, the district regularly holds field days, featuring games and rented equipment, but had never had an incident such as this before. Thursday’s field day was held inside due to cool, wet weather – but this time, a little before noon the 15-foot-high slide collapsed.